Brown, gray, gold and black color mixed small subway slate backsplash ideas. Unique color combination for slate stone for any kitchen backsplash projects. White granite countertop with red and gray speckles, light maple cabinets and copper hood. Beautifully complimented by 1×3 small subway slate backsplash ideas. Light grey 3cm countertop with dark brown cabinets. Diagonally laid 18×18″ slate floor tiles and a matching slate mosaic backsplash with 1×1 glass inserts, to tie together the whole kitchen design. White and glossy top cabinets, dark island cabinets with a light grey and white countertops, beautifully married by a slate 1×3 small subway slate backsplash ideas. White cabinets with a light beige countertop, bronze faucet, peachy walls and white windows. 1×3 tumbled gold gray color slate mosaic tile for a backsplash under the window area. Spacious kitchen with red cherry and light maple cabinets with black countertop. Middle island with Santa Cecilia granite and bronze sink. Beautiful backsplash design with brick look on the sides and framed diagonal 1x1small subway slate backsplash ideas in the open area behind the cooktop. White cabinets with an open area behind the cooktop, Santa Cecilia countertops with 4inch granite backsplash running on one wall. Gorgeous 1×3 slate mosaic tile backsplash wall. White cabinets with a light busy countertop, bronze faucet, peachy walls and white windows. Curved kitchen island in the middle with dark brown hardwood floors. 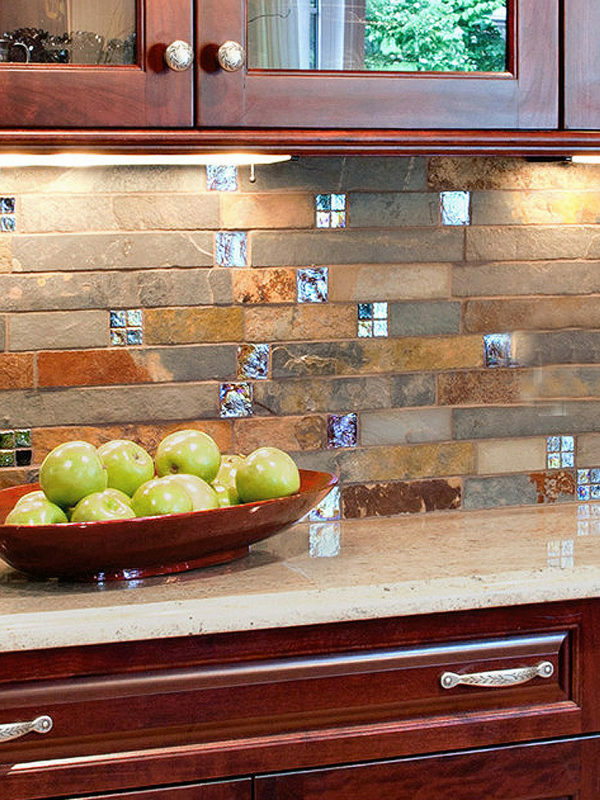 1×3 tumbled multicolor slate mosaic tile for a backsplash for a perfect finish. 1″ x 3″ gold and gray color mixed slate backsplash tile with white cabinet & granite countertop. Light brown cabinets with light countertop, copper hood and faucet. Beautiful slate mosaic backsplash running under the cabinets and up to the ceiling behind the cooktop, to create one of a kind focal wall. Minimalistic kitchen design with clean white cabinets, black 2cm countertop and stainless steel hood and cooktop. Decorated by small staggered 1×2″ California gold slate mosaic tile as a focal point. Open kitchen area with big two level islands in the middle, beige countertop with dark wood cabinets. Dark brown cabinets on the walls and black countertop along with stainless steel appliances, complimented by 1×1″ small squares slate mosaic tile backsplash. Light brown cabinets and floor with red carpet on it. Very light and airy countertop in front of gorgeous slate mosaic backsplash on the whole wall. 1″ x 3″ Gold and gray color brick style slate mosaic tile. 05″ x 1″ brick style slate mosaic tiles. Call us for details & to place an order. This entry was posted in BEIGE, BRICK, BROWN, GRAY, MOSAIC, SLATE. Bookmark the permalink.